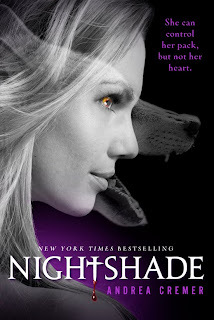 So, these are the new covers for Nightshade and Wolfsbane . The Nightshade cover is for the paperback, but it's my understanding that the Wolfsbane cover is for the hardcover. I just have to say, I am NOT at all happy with these covers. I'm really sorry, Andrea and Penguin. I love you both, but I feel like these covers don't even come close to the awesomeness that was the first two covers. I know it's kind of taboo to say this, but they look like cheap fiction factory series books to me. Look at these covers. Especially Nightshade. It is gorgeous! It's what made me want to read the book in the first place. I'm not saying that they shouldn't change them, because honestly, these covers don't really reflect Calla (who refuses to put on any makeup), but if you're going to change them, they need to be something just as fantastically eye-catching as these are. P.S. There's a Twitition to get back the old Wolfsbane cover! Check it out here! Hey, everyone. Editor Jill here. Andrea was nice enough to let me jump onto her blog to thank you all for your enthusiasm and feedback on the Wolfsbane jacket design. You’ve given us a lot to think about, and we’ll be having many Wolfsbane--related meetings here at Penguin headquarters in the coming weeks. Thanks so much to Penguin for listening to your fans!! That's why we love you! These new covers are absolutely dreadful. I totally agree with you--the books look self-published, now. But the thing is: Terrible covers don't matter. What matters is that Andrea Cremer is writing awesome books. The words on the inside are what holds the true beauty--they're the reason you love reading, and love it so much that you maintain a blog about it. Trust me, I feel you. These new covers repulse me. Just remember: Andrea Cremer is still the author of these amazing novels, and Penguin can never change the interior design (the words on the inside). l very much agree, l love the two other covers but these just seem like they are done quickly in a studio! The Nightshade one is ok, but l don't like how they overlap, it's a good idea as obviously she changes into both but .. not loving it! I agree the new covers look pretty cheap, but I didn't really care for the old ones either considering (I haven't read the book) but if a character doesn't wear makeup, a glammed up model on the front just seems like an odd choice. Still, if they realized that and were going to redo them, I can relate to hoping for something better. I don't mind the new Wolfsbane one though, but the new Nightshade is a little tacky. 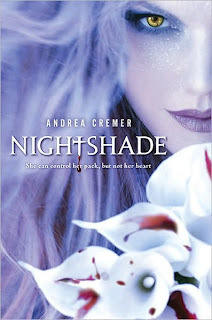 wait....I don't get it, Nightshade will be published with that repulsive cover from now on? what was wrong with the old ones? 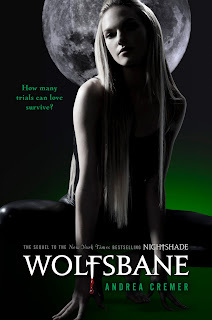 I didn't like nightshade so I won't be reading wolfsbane but honestly, I don't see an average browser purchasing a book with such a horrid cover. I'm so dissapointed with the new covers. The original ones were so gorgeous and eye-catching. I'll obviously still read Wolfsbane, because Andrea is a very talented author, but I'm still sad. I agree! I already bought Nightshade and I want the sequel to actually match it! It would have been okay for just hardback, but since I spent almost $17 on the first book, I want my next $17 for the second to be worth it! I agree with the sevenal commenters before me, these new covers look dreadful and tacky but it's what's on the inside that counts. I really liked the old covers too and I can't say that I like the new ones. I still love Andrea Cremer's books and I'll still read this series, but since I have the first books original cover, I think the second book will look tacky on my bookshelf. I believe that they should've at least used the old covers for the rest of the series and then did a rerelease in the new ones. I completely agree!!! Now my Nightshade won't match Wolfsbane and the new covers do look completely cheap in my opinion. I will still definetely buy it, but i am not to happy.... The new covers definetely wouldn't make me even look at the summary in the store, when the old Wolfsbane cover would definetely get me interested. I'm a new follower by the way, and awesome blog! I have to agree. I really dislike the new covers, I can't understand why they even wanted to change them. I'm actually confused, because the old covers were so much nicer! I just hope people won't be put off by these new awful covers, because it'd be a real shame :/. I don't mind the new covers. If I hadn't already read Nightshade and loved it I don't think I would have picked these up just from looking at them. But I am looking forward to Wolfsbane regardless of the cover. What bothers me is all the money that readers have spent on the original cover and now have to replace it if they want their books to match...like I do. That's not fair to do to the readers. Thanks for the link to the Twitition! I signed it. The new covers are okay(ish) for the paperback version, but I sincerely hope that the publisher doesn't change the look mid-series for the hardcover version. As many before me have mentioned, it is incredibly frustrating to have to buy a second copy of a book in order to have a matching collection. Goliath by Westerfeld got a cover today as well! Did you delete my first comment, or did it just not post? The old saying , 'don't judge a book by its cover'..it unfortunately does happen. Who was the marketing brain wave that decided to mess with what was gorgeous?? Still can't wait to rad Wolfsbane. Thank goodness I have my awesome Nightshade hardback cover. Please its not April Fools yet is it? I would put this down to a bad experiment and scoop up that idea and plop it in the rubbish, no offense, but , why mess with it? I totally agree with you. I have not read the series myself, but I did prefer the original covers to these new ones. Seeing these new ones has kind of thrown me off this series (I will still read them someday, I've heard some really great things about them). I hope they don't change the covers here in Australia. If anyone's got the ARC of Wolfsbane with the original cover idea then you are so lucky! I agree! The old covers were gorgeous although innacurate. I think the new covers look a bit trashy. Regardless about how I feel about the new covers, I absolutely HATE it when publishers change the style of the hardcovers to match paperback editions in the middle of a series. I want my hardcover editions to match! I don't see why the hardcover editions can't continue in the old style while the paperbacks take on the simpler new one. Publishers should realize by now that we book lovers are OCD about our series titles matching each other. As for how I feel about the new covers, I'm not a fan of them. They're plain, and probably a lot easier (and cheaper) to put on a paperback. But they look like every other random paranormal or urban fantasy book. They no longer stand out. Blending into the masses cannot be better for sales. Considering how much praise the old covers were receiving, I do not understand this change at all. Okay, I'm putting in my two cents' worth! I don't dislike the new covers; in fact, I like them just fine...for the paperback edition. What doesn't make any sense to me is the mixing of styles that would result if the new Wolfsbane cover were used for the hardback edition. Cover styles should match. That is so elementary that I can't understand why the publishers can't seem to see this! There's nothing wrong with the new covers, but put them together, for crying out loud! The original covers are visually stunning, even though everyone is saying that the "glammed-up" cover model does not accurately represent Calla, the main character of the novel. (I must point out that I haven't read the book.) Still, these covers are so beautiful that I would love to frame them, but only if they were available as posters, of course. My book addict's heart can't do that to a dustjacket! Anyway, I do like the new covers. They are not as gorgeous as the original ones, but that's because they're done in black and white. But I still like them. They are very stark, very dramatic, while the original ones are works of art. I would say the new covers are great graphic design. I say, pair up these covers correctly! The originals should go together, for the hardbacks, and the new ones should, as well, for the paperbacks. As soon as I found out about this, I dashed an email (pics included to make my point) off to the publisher, Philomel Books -- which is the children's publishing division of Penguin. Then I immediately published a post about this on my blog, Twilight and Other Dreams. I'm DEFINITELY ticked off about this! I completely agree with you. I guess the new covers are kind of pretty, but they look more like sultry adult novels rather than the epicness that is Nightshade. And I understand changing the paperback, but now the hardback will match the new paperback? NOOOO!!! I love the othe one so much more! Oh well, I guess we'll have to stick with the saying "Don't judge a book by it's cover". Andrea Cremer said that the original cover didn't portray the series and calla very well but which book does? i don't many covers which depicates a story or the characters perfectly but publishers don't change the covers because of that! especially when the original ones were getting such rave reviews. it just blows my mind thinking why the publishers did this. actually, sometimes I wonder if the original covers were more expensive to produce. I agree with you 110%! Even though some of us know the author and how fabulous her work is, not everyone has the ability and they go by cover alone. Honestly, I'd probably walk right by the new covers. BUT, The Nightshade hardcover (in person) was amazing! I thought it was one of the coolest covers from last year and I loved the first Nightshade one just as much. I assumed at first that these new covers were for the paperbacks and thought "well, okay.." but when I heard they wanted to change book 2 to THAT, I was very disappointed. I do really hate when books are changed, either from paperback to hardback, or when the "theme" is completely different halfway through the series. I LOVE the hard covers and I like the new covers. I think they are trying to be appealing in a different way wirh the new covers. I like it when the hard & paperback versions have two different covers. Andrea Cremer deserves the best covers ever. These are not the best covers ever. I think the covers work for the paperback editions - if they were both for the paperback editions. I don't think it makes sense to change that beautiful originally planned green cover for the new hardcover as the art/style just won't match for those who own the original Nightshade HC. I think both original HC designs were beautiful and work well together. And the two new designs if just for the PB versions work well together. To me that's the perfect compromise, but that's just me. I don't like the new covers, I think they look more like Adult Urban Fantasy (generic) covers. Which, I don't like. I would be totally fine w/ them if all the paperback copies were in the new style but they kept the hardcovers as they were before. I'm mostly angry that they are changing the style mid-series, which means my covers won't match, and I'm annoyed. Sigh. I agree wholeheartedly with everyone who pointed out that the new covers would be more suitable to adult urban fantasy novels. So true! However, I wouldn't mind having them on the paperbacks. But please, Philomel, DON'T put that new Wolfsbane cover on the hardback!!!!! Look at how upset we fans are!!!! If anyone wishes to send an email (which is what I did!) directly to Philomel Books, go to the post on my blog. I have included it there. BRING BACK THAT GREEN COVER FOR THE HARDBACK, PHILOMEL!!!!!! Hey everyone. I completely agree. These covers are boring and so un-original compared to the pervious covers. Apparently Penguin "recieved tons of support" for these new covers. I'm not really seeing the support here. :) I am going to write an email to Penguin tastefully asking why the books can't be realeased in the old covers and see if I get a response. I totally agree. Where you could spot the original covers a mile away on the shelf, the new ones look like every other paranormal book out there. Epic fail, Penguin. On the bright side -- on Andrea's blog, her editor stopped by and it looks like they'll be reconsidering the decision to change the covers. Is there anymore news regarding the covers? I really don't like the new covers and don't want to buy Wolfsbane or Bloodrose until they all match the gorgeous purple Nightshade cover I have. approximately 75% of your automobile value.